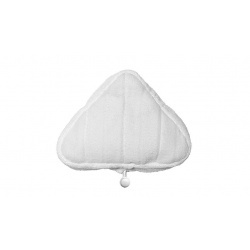 Replace the old or worn out mop clothe of your Richards 720501 Steam Cleaner with the Morphy Richards 70466 Steam Mop Cloth. This replacement clothe will also come in handy when you’re tackling large cleaning jobs and don’t have time to dry the soiled mop cloth and reuse it. Each pack comes with 2 hard floor micro-fibre clothes. Easily attach the cloth to the steamer using the Velcro attachment. 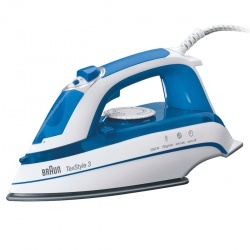 The Equip Steam iron is a lightweight and easy to use iron. Get a great finish with the 35g/min steam rate and powerful 80g steam boost. Steam through your ironing pile! A durable and easy to clean non-stick soleplate maintains a smooth glide for easier ironing. A steady flow of continuous steam at a rate of 35g/min loosens fabric with each pass of the iron, removing creases as it passes. For stubborn creases take advantage of either the 80g steam boost or the water spray. The Equip has a 300ml tank capacity that supplies the iron with water for steam. It's easy to fill and view the water level with the handy water level indicator. Anti-drip technology prevents unsightly water marks being left on clothes. Ideal if you tend to iron something just before you need to wear it. The Anti-drip also prevents the water leaking from the soleplate if you accidentally forget to empty it before you store the iron away. With inbuilt anti-scale that filters water from the tank before it is heated and turned to steam. The anti-scale helps limit limescale but it's important to clean the iron as well. The self clean function helps flush any limescale deposits that may have collected on the inside of the soleplate. Carry out the self clean function frequently to maintain steam levels and prevent deposits from spilling onto clothes. The microfiber material helps to loosen dirt on your sealed hard floor surface and will leave the floor streak-free. The steam mop pad simply attaches to the mop head by the Velcro strips. 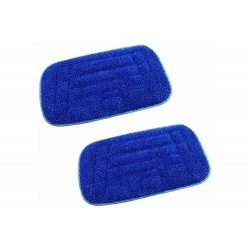 The mop pads are machine washable so you can use them again and again. If you are looking to reduce the time spent on your ironing whilst making it as easy as possible, then the Russell Hobbs 22520 Auto Steam Iron is the ideal option for you. The powerful 2400w Russell Hobbs Iron combines a non-stick soleplate with 45g/min continuous steam with and a 130g/min steam shot to remove creases from stubborn fabrics such as denim in no time. A generous 320ml water tank means you can get through a sizeable pile in one go without refilling and the anti-drip feature ensures you won’t leave you garments covered in water marks. The innovative EvenSteam Soleplate design includes more steam holes than most other irons, it exerts a more even steam distribution making your ironing easier, quicker and more effortless than ever! A powerful vertical steam function means you can take conventional ironing to the next level and steam hanging garments with ease, from bed linen to curtains. The spray function helps you get to grips with stubborn creases in one go giving your clothes a professionally ironed finish and the anti-drip function ensures there are no water marks left on newly washed items. The 2m cord means that you can iron at your convenience and the ergonomically designed unit fits nicely in the hand and makes for comfortable ironing. The 22520 Auto Steam Iron has a self-clean function to protect the iron from scale damage - this will prolong the performance and life of your iron meaning it will become an indispensable part of your laundry routine. The Philips PerfectCare Anti-Scale Cartridges will eliminate 99% of calcium in your iron, increasing it's life by up to 5 times. They are suitable for PerfectCare Pure steam generators equipped with Pure Steam technology. Each cartridge will last on average for 3 months of ironing, depending on water hardness and the number of hours spent ironing a week. When it needs replacing, your iron will warn you, then it will start beeping and will stop functioning, to ensure you don't get dirt on your clothes. You can then either use filtered water with the old cartridge inside, or replace it with a new cartridge. Breeze through your family's ironing with this 2400 watt iron, for fast heat-up and less waiting around. With a powerful 100g steam shot and 35g constant steam you can easily get through the toughest creases in your ironing pile. A shot of steam where you need it most, whether in between buttons, shirt sleeves or into pockets. The large steam shot from the iron's tip will help you crush creases in all of your ironing pile. To relax fibres in clothing and help remove creases quickly and easily. A large water tank so you spend more time ironing than refilling your product. Tip Technology produces a dedicated, powerful shot of steam, allowing you to get moisture into the trickiest of places. This can be used in a horizontal or vertical position. Introducing our most premium soleplate; Diamond. With its incredible durability it is designed to outlast even the best. 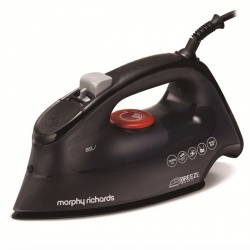 With its exceptional glide-ability you can iron your garments with ease time after time, to the pristine finish you would expect from Morphy Richards. Constant steam output relaxes your fabric to facilitate easy pressing, giving you superior results. A powerful shot of steam that penetrates deep into the fabric to remove difficult creases in the toughest fibres. This system ensures that even if the iron is used before reaching the required temperature, water will not leak onto the fabric. Breeze through your family's ironing with this 2400 watt iron, for fast heat-up and less waiting around. With a powerful 115g steam shot and 45g constant steam you can easily get through the toughest creases in your ironing pile. 2400W for fast heat up, means less waiting around for your iron to get to the right temperature. To reduce limescale build up and prevent damage to your iron and clothing. A stylishly designed steam iron packed with features to give the ultimate result. 2400W wattage with a 350ml tank, a 120g shot of steam and auto shut off gives a product packed with features. A 2m cord ensures ease of use. Breeze through your family's ironing with this 2600 watt iron, for fast heat-up and less waiting around. The Ionic soleplate glides over fabrics, reducing static leaving a silky-smooth finish. Ionic soleplate glides over fabrics reducing static, leaving a silky, smooth finish. Auto shut off technology for added peace of mind. As well as producing a continuous steam output of 40 g/min, the Supremesteam Traditional Steam Iron can create a 110 g/min steam shot to ensure even heat distribution. This allows you to smooth stubborn creases and wrinkles on all manner of fabrics, streamlining the ironing process. You can also use powerful vertical steam to remove creases from curtains, hanging garments and upholstery. The Supremesteam 23060 Iron features a stainless steel soleplate, making it easy to glide across fabrics. A 2 m long power cord gives you the freedom to move effortlessly while ironing, making the chore simpler and easier. To further enhance your comfort, the iron has a soft touch handle and dial to keep you in complete control. Complete more ironing before needing to refill the water thanks to the Supremesteam Iron's 300 ml water tank. For added convenience, the iron also features a self-cleaning function to protect it from scale damage, extending its life and performance.